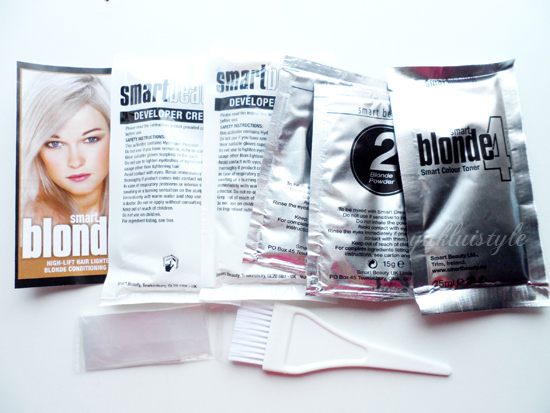 Readers have been asking me what bleach I’ve been using to lighten my hair and to get blonde. I’ve purchased this the other day as I do have some horrendous roots, 3 inches. Can purchase this in Savers, Superdrugs or online. In Savers, it sells for £2.99 or £3.99. Cant remember exactly. At Superdrugs, it sells for £4.99. You can purchase these on Smart Beauty’s online store or Amazon. This is the only hair bleach I’ve used. It’s a bleach that doesn’t contain ammonia or PPDs which is great as you don’t get that horrendous, strong scent. It also doesn’t your hair as much or leave it porous as ammonia would. In each box of this shade, you get, 2 sachets of developer cream, 2 sachets of blonde powder, toner conditioner, instructions, gloves and brush. 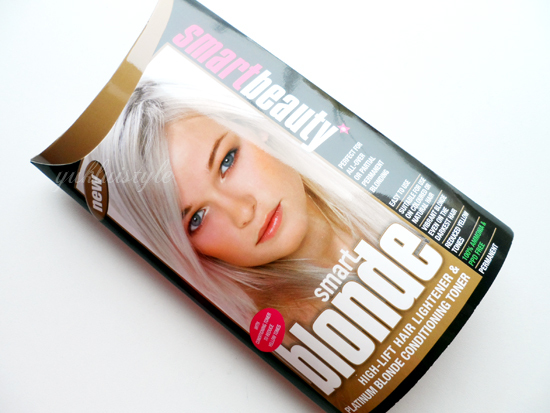 There are different shades of blonde boxes so the toner included will differ. The instructions are easy to follow. With my long hair, I need to purchase 3 boxes. If you have shoulder length, 2 boxes will be required. 1 box is enough for your roots. Once you mix the developer with the powder, you get a bleach that has a not too thick consistency and will not run. It’s easy to apply and use. To be honest, the brush that came with it isn’t really good to use, so I end use using my hands to rub the bleach into the hair so it gets in between each strand. The bleach smells like chlorine. It’s not bad, just smells like you’ve been in the swimming pool. When my head is really greasy, this bleach won’t burn but when my scalp is dry or itchy, it does burn. Just don’t rub it into the scalp. It’s easy to wash out and the toner conditioner leaves my hair soft. I don’t really use the toner as I dye my hair a different blonde shade. The toner is purple and it will cancel out the brassiness and yellow tones in the hair. This bleach doesn’t leave my hair damaged. Even after conditioning and blowdrying, it’s nice and soft. With this bleach, you do need to wrap your hair with cling film. The heat will aid the bleach development. I had also put a plastic bag over the cling film. Without the cling film, the bleach will become powdery over time as it is exposed to air and will be less effective. You do have to work fast. In general, this is a great bleach! It lifts my hair 7 shades lighter. Depending on my current colour of my hair and what colour I’m going to dye afterwards, I may only require one or two sessions of bleaching. People who attempt to dye their hair blonde from a dark colour, hair will be ginger, orange, be on fire. It’s normal. You will just require another bleaching session. I keep repurchasing this bleach as it is affordable and will keep doing so. i've been looking for a good bleach product. Thanks for sharing! I have really dark hair and will need to bleach more than once – how long should I wait between each bleaching session? I think you provide one of best provide cosmetic hair dye.Thank for sharing us. what colour is your current hair and what colour are you trying to achieve? Can I use this on relaxed hair? if its healthy enough then i don't see why not!